I went hiking at Fort Snelling State Park. Such a pretty place. Here in Minnesota, the ice is melting and I think winter is finally near its end. People are leaving their homes to enjoy the day, which means Minneapolis will feel like a lively city again. I look forward to seeing people flood the bicycle greenways and working on their gardens this upcoming Spring. As you may know (if you have been reading my blog), I have been quite active this winter. Even in negative degree weather, I was still out and about, going on walks, playing ultimate frisbee, snowshoeing, or hiking in a nearby state park. Now that the weather is even warmer, I’ll be keeping myself extra busy. I plan on working on my garden when the ground thaws, bicycling to work, and playing Twin Cities Ultimate League games. But, that’s for the future, I’m sure you’re more interested in what I’ve been up to lately. Well, as I mentioned before, I have been walking a lot. Everyday, I go on a long walk. Sometimes, I walk to the nearby library and rent out picture books to read to the children at my job. Other times, I walk along the Mississippi River and daydream. But on most days, I leave an hour early before work and take the long route to my work place. I’ve always liked walking, but in the last month, I’ve really learned how important a long walk is to me. I’ve noticed I’m much more relaxed and I think it is because I’ve been taking the time to walk and collect my thoughts. I spend most of my time thinking about what has been eating on my mind lately and reflecting on it. If I have nothing to think about, I’ll go into a somewhat meditative state or I’ll sing a tune. Either way, it has been very healthy for me and I’m thankful for having the time to go on these long walks. Soon, I’ll be converting my walking time into bicycling time, but I’ll make sure to fit in those personal reflective moments in my schedule. You know what else has returned back in my life? Jazz. I used to listen to jazz all the time a few years back, but in recent years I stopped listening to jazz all together. Well, my buddy Sean invited me to a Vocal Jazz Night at Jazz Central, featuring Abacus Jazz trio. Jazz Central is in Northeast Minneapolis and hosts jazz performances 5 nights a week! It’s a pretty hip place. You enter on Central Ave and follow a long hallway until you find a stairway going down (by this time, you can hear the music coming from the basement). As you walk down the steps, the lights get dim, you take a left, and you enter a low ceiling room that is covered in twinkly lights. When you enter the room, you see jazz performers to your right and a bunch of seats to the left. Sean and I found a couch near the back, sat down, and focused our attention on the performers. I closed my eyes and listened to the music. After a couple songs, I learned that Sean had met the band before, so he chatted them up and in the end they played a song in my honor called, “Mali.” I thought that was pretty cool. The rest of the performance went really well. I think my favorite part about Abacus was that they played equally. It seemed like each instrument had their own solo in each song they played. I liked that. It was a very laid back kind of place; I highly recommend it to anyone looking for something to do in Minneapolis. If you’re interested in knowing more about the Jazz culture, check out Jazz Police. They are very up-to-date on the upcoming jazz performances in the Twin Cities. And for the last thing I’ll mention, I’ve picked up a new hobby. Every Thursday, I dedicate 2 hours of my evening volunteering at a bicycle shop called Mr. Michael Recycles Bicycles, also known as MMRB. 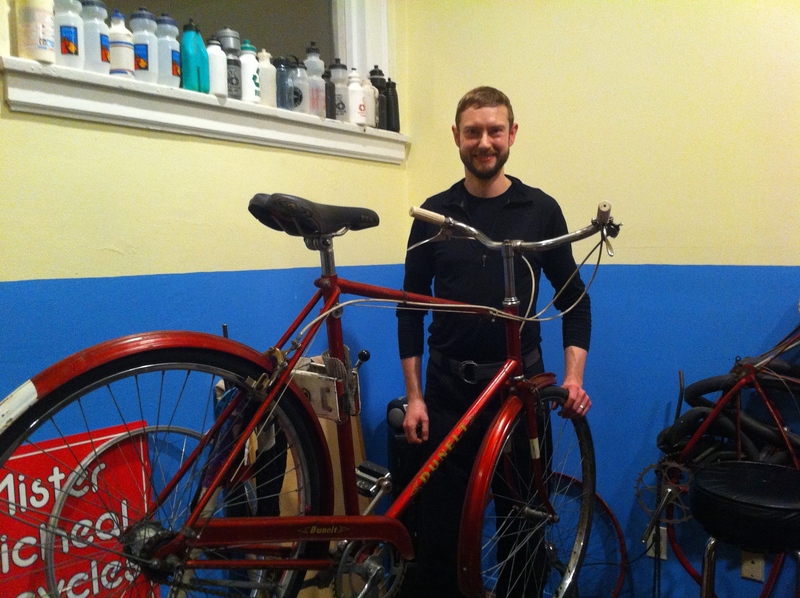 My friend Sean (the same one who I went to Jazz Central with) had worked at MMRB in the past and heard that I wanted to learn bicycle maintenance. So, he invited me to join him a couple months ago and he’s been teaching me how to fix bicycles ever since! He’s a great teacher and I’ve become much more comfortable with basic bicycle maintenance thanks to him. But enough about me, let me tell you about Mr. Michael and his wife, Benita. So, MMRB is a private company that gives away bicycles. They gather discarded/donated bicycles, repairs them, and gives them away. Simple as that. They run their business primarily as a ministry, so their calling is to give away bicycles. They do sell parts and vintage bikes, but only to offset business expenses, so that they can continue giving away free bikes to people in need. I think the coolest part is the community that is formed through this process. 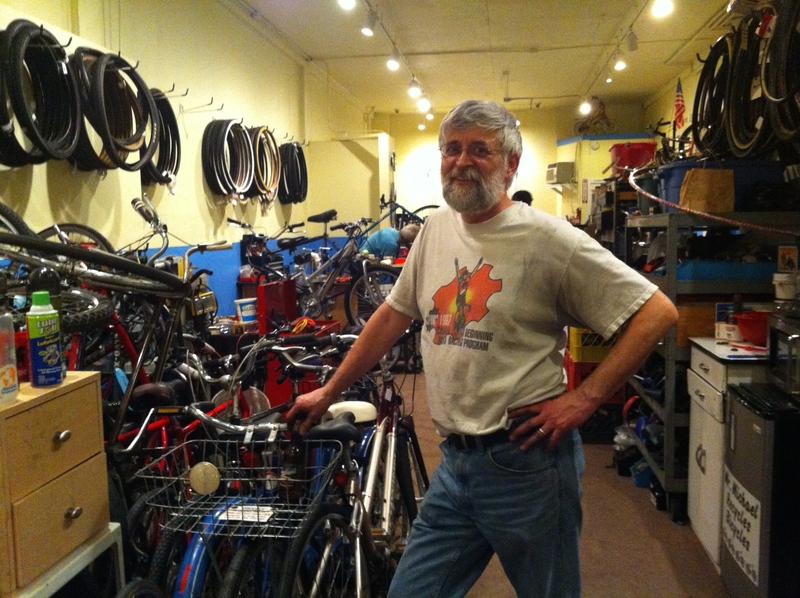 Volunteers come in every week to fix discarded bicycles. Think about it, instead of going out and partying on their Thursday night, these volunteers spend their evening helping out for a good cause. That’s what I really like about MMRB. I like the people. They are so kind and patient, especially to my non-stop questions about how to true a tire or the best way to take apart a wheel hub. I really appreciate the work that they do and I am happy to be apart of their community. Their website is a bit outdated, but if you want to hear about their upcoming events, then the best way is to like them on Facebook. This is my friend, Sean. We were working on this bike together. Well, that has been my life recently. This next month will be full of bicycling, working, and editing my Mongolia film. I finally have a set presentation time. It’ll be on April 25th starting at 7pm in the Expedition Room at Midwest Mountaineering. I’ll be presenting about my backpacking trip through Bogh Khan Uul Strictly Protected Area, Mongolian culture, and my experience on the TransSiberian Railway. If you’re interested in going, then please stop by. I’ll probably be posting more about it, maybe putting up a sneak preview when the presentation gets closer. Well, thanks for reading. Till next time. 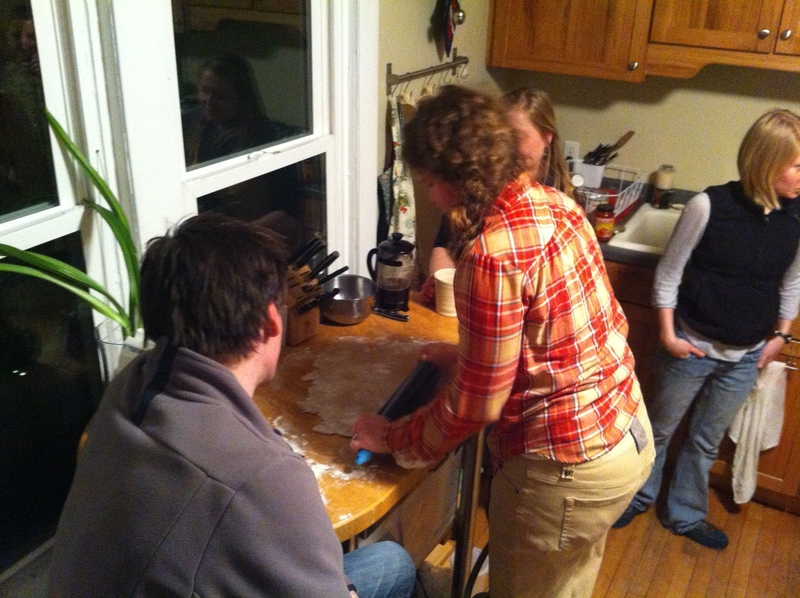 Making pizza with friends at my house.